Like many loot-based games, Anthem has six different item rarities that determine the quality of the gear you find. Here's a quick reminder of them in order: Common, Uncommon, Rare, Epic, Masterworks and Legendary. Masterwork gear and Legendary gear, as the two top tiers of gear rarity in the game with unique perks and abilities built into them make them the only go-to option for the best weapons and gear when you reach Anthem's endgame. However, they are not easy to obtain. To help you out, this guide shares with you some tips and tricks of getting more Masterwork and Legendary Gear fast and easy in Anthem. How To Get More Masterwork Fast and Easy in Anthem? To boost your chances of getting Masterwork items, you can do two things: play through activities at higher difficulties and take on Legendary Contracts and Strongholds. Once you are level 25, it seems that there are?six different Masterwork weapons that will start dropping from playing missions on hard. By the way, you can also but Masterwork weapon components and crafting materials with Cheap Anthem Shard Packs at Joymmo.com, a reliable and cheap online in-game currency store. Another great way to find Masterwork gear is by completing both Legendary Contracts and Strongholds. Legendary Contracts are special contracts given out by NPCs in Fort Tarsis, the game's hub area,Unlike regular contracts, they're longer and more difficult, but they also come with a higher likelihood of Masterwork gear dropping. Then, there's always Strongholds. ?Strongholds are linear missions with multiple different objectives to complete and a large boss battle at the end. Stronghold chests have a very high chance to drop you masterwork gear, weapons included. Also, grinding the stronghold bosses, since they drop guaranteed masterwork gear. In addition, as is the case with all of these, farming chests in free-roam is always another, if less dependable, option. 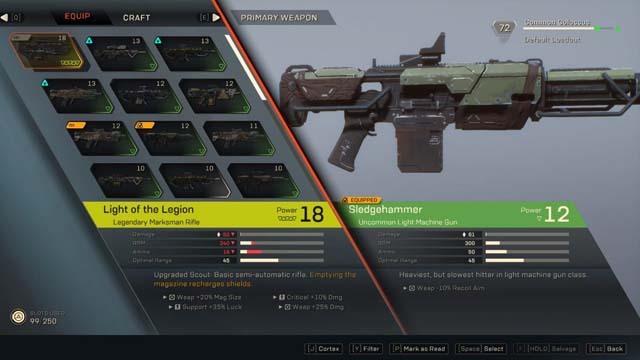 Legendary is the most powerful gear tier in Anthem and, unfortunately, there's no direct way of guaranteeing it drops. The best way to get them to drop is to complete strongholds and grind the chests and bosses in the activity. These will have the high rarity items like Epic and occasionally you will find Legendaries and Masterworks but grinding them will eventually let you all of them. Also, once again, farming chests in free roam is always something you can do. That's all you need to know about farming Masterworks and Legendary Gear in Anthem.